me in my lame brace. I'm a fifteen year old soccer & track girl & I've been experiencing and dealing with back pain for over half my life. I made my first complaint at seven years old, had an x-ray done, & my pain was simply dismissed with the lame excuse that i was just an extremely active seven year old girl with a very mild case of scoliosis that must have fallen and hurt herself. For about a month & a half I basically took it upon myself to limit what i did to prevent pain, i placed myself on an imaginary "disabled list" in the second grade. I stopped playing football/soccer/baseball/basketball with the boys at recess and lunch time & eventually my back felt better. For the next six years my pain came and went. It would recur & switch sides, from left back pain to right back pain, but consistently remained mid to low back pain. I complained several times to my physicians & was dismissed each time with more lame or false diagnosis which gave me no true emotional or physical relief. Every time i left the doctors office i was simply told to rest for a couple of months, ice/heat the painful areas, do physical therapy, take anti-inflammatory meds and be patient. When i was 13, i saw an orthopedic physician who ordered an MRI which revealed that i had spondylolysis (Degeneration or deficient development of a portion of the vertebra; commonly involves the pars interarticularis, which can result in a spondylolithesis). I never really let the pain stop me until it was so unbearable that i couldn't walk without feeling pain. from the time that i was 13-14 the pain was consistently present but flare-ups would only come every couple of months, and i would take a few weeks off & be back at it. Then in October of 2008 i was volunteering at an elementary school autumn festival when all of a sudden i found myself unable to walk. i froze up. and suddenly a sharp excruciating pain shot down my left leg. It was the worst, most intolerable pain i had (and have) ever experienced. Unable to contain myself, the tears started to flow. I managed to limp to my moms booth to tell her about the pain, but unfortunately she couldn't leave, there was no one else to cover her spot. I had to walk about 60 yards to the car, alone. I've ran many long distances in my life, but these 60 yards felt like the longest distance i had ever had to live through. I got to the car and couldn't find any way to sit comfortably. I cried for two hours straight, the pain would not subside & my mother & brother would not return. Finally they did & my mom saw the full effect and toll that this pain had taken on me. She immediately phoned my physician who, without hesitation, prescribed tylenol with codeine. It did nothing but make a nauseous. Next on the list was vicodin, which didnt take the pain away but made it close to tolerable. Of course i was in bed all day for the entire week following the incident. I made an appointment to see an orthopedic spine specialist, but unfortunately for me, i wouldn't see him until November, a month from when the pain started. I then began a home instruction program through my high school in an attempt to keep me up to pace, but that was near inevitable. Prior to my visit with the orthopedic spine specialist i had an MRI done. During my appointment the doctor pointed out that the MRI was of low quality and not all that clear and easy to read, but still concluded that there were no fractures in any of the vertebra. He did, however, point out that there was a disc herniation, & for that he prescribed steroids & a pain medication Ultram (an Opioid used to relieve ongoing, moderate pain, that can sometimes cause dependancy). These prescriptions had brought me closer to being "pain free" but the Ultram did have its side affects. I experienced random nausea, anxiety, sleeplessness, lightheadedness, & weakness. The doctor also suggested i receive an epidural-steroidal injection directly around the area of the herniation. The shot was quite painful, and the 4 days after the shot i felt worse than before it because the area was so tender from the penetration & the medications in the shot. soon as i felt the pain worsening once again, i knew it was time for another shot, & i got it 4 weeks after the first (4 weeks is the minimum amount of time you can have between any two shots of this specific medication & dosage i was receiving). During all of this i was also seeing a pediatric rheumatologist because some blood work i had done had revealed something that suggested i might have arthritis. Two weeks later, it hurt again, my rheumatologist & orthopedic spine specialist concluded that i would probably benefit more from a Sacroiliac joint injection if i indeed had arthritis. The SI joint lies next to the spine and connects the sacrum (bottom of the spine) with the pelvis (hip), the doctor then inserts a needle into the sacroiliac joint to inject lidocaine (a numbing agent) and a steroid (an anti-inflammatory medication). The shot did help, didn't completely take the pain away, but it lead my rheumatologists to believe that i indeed had this arthritis condition, i was devastated. The pain finally came back, to near full force, so i didnt have arthritis after all. I felt as if i had been jerked around for about 7 months, still without a clearly definitive diagnosis & cure.I went to my primary doctor and told him how i felt that i have been going in circles, so he redirected me to an orthopedic spine specialist & surgeon. My primary physician also revealed to me that the other orthopedic doctor i had been seeing was more of a pain management doctor anyway. I managed to get an appointment with this new orthopedic spine specialist/surgeon a month after i called to schedule it which was the soonest i'd be able to see him. Before going, i got a CT Scan done, to give the doctor clear and current insight into the problem. After meeting the doctor & briefly explaining to him what i have explained to you all so far, he got on the computer to view my CT scan. I was able to stand right over his shoulder viewing this with him, and had i known how to operate the program he was using i couldve drawn a good conclusion as to what was wrong with me. A BILATERAL FRACTURE IN MY L5 VERTEBRAE there were to two extremely apparent breaks in the bone. the technical terms he specifically used were "pars interarticularis defect" (also called spondylolysis, which is a fracture/break of the vertebral arch that holds together the superior and inferior articular processes). the leg pain comes from a pinched nerve as a result of the strain on the surrounding vertebrae & discs. i was back at square one! if you recall, when i was 13 the first orthopedic doctor i had seen told me i had a mild case of spondylolysis & simply referred me to physical therapy & had me refrain from all sports, which helped, temporarily. 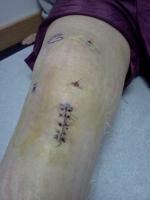 Now, my current orthopedic spine specialist/surgeon, told me sometimes these things heal on their own by resting. I was still in shock, i couldnt believe it was actually broken, even he couldnt believe i had been playing sports with this broken part of my spine being how it was. He told me i would need to get a bone scan done to see if the fracture was in the process of healing itself. the results revealed that there might be a possibility of that happening, so he had me referred to another orthopedic that made body brace's & said i'd have to wear it 23 hours a day for 2 months. After doing some research on this brace thing i discovered that it'd be more of a cast, extremely noticeable, & uncomfortable. once again, i was devastated & reached a new low. I have also been told that my case of lordosis is not so mild anymore and the curvature of my spine is about 37 degrees, so the brace should help that too. As im typing this i'm wearing this contraption. 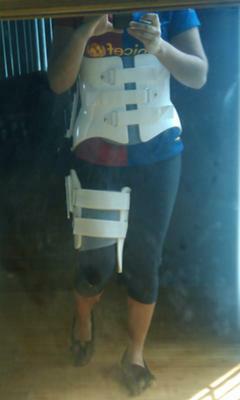 The brace extends from below chest to my waist-line, and down my left leg til right above my left knee. I have no range of motion in my waist, so i cant sit. All i do is lay in bed for 23 hours, taking off the brace and getting up only to use the restroom and bathe. I hardly leave my house, and i can surely say im depressed. this has been so hard on me, in total ive missed 3years and 2 months of sports due to injury.